Cultural and historical tours and hikes. Spanish classes available. pan de Comala served with organic shade-grown coffee from La Yerbabuena. Wireless Internet hookup. Fabulous views from the terraces. Large library. One kilometre of beach bordering an ecologically protected Lagoon and Bird Sanctuary. Distinctively designed and affordable condominiums, hacienda townhouses, estate homes and lots. On-site amenities: pool/swim up bar, Jacuzzi, tennis court, workout area, spa, barbecue & social areas. Breakfast at the main house with fruit, fresh juice, traditional sweet bread and the main dish of the day. The state of Colima located on Mexico's Pacific Coast is one of Mexico's smallest states with just 2000 square miles. The state of Jalisco borders Colima to the North and Michoacan to the East. The magnificent beauty of Colima and its natural wonders draws many visitors each year. Before the Spanish arrived in 1523, the land was inhabited by different Indian groups at various stages in history. The Otomis, Nahuatl, Toltec, Chichimec and Tarascan cultures all flourished in this region. The capital of the state, also named Colima, is one of the oldest cities in Mexico. It is situated 28 miles inland from the coast at an elevation o 1,804 ft, making the climate cooler and less humid than the coastline. Founded in 1527, it represents the 3rd city established in New Spain by Hernan Cortez. When entering town, you will be greeted by one of the city's landmarks, El Rey Colim�n monument. 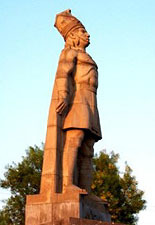 This statue is a tribute to the area's native leader who fought valiantly against the Spanish invasion. Fertile farmland surrounds Colima. Known as "The City of Palms", tropical fruits and palms grow in abundance here. The city has a pleasant atmosphere and the town center has retained its colonial feel. A nice park to visit is Jardin Nunez located 4 blocks from downtown. This spot offers the visitor a chance to relax amidst a beautiful semi-tropical atmosphere. Just south of this location is the Piedra Lisa Park where you can slide down the city's famous sliding rock, thereby assuring according to legend a return visit to the city. 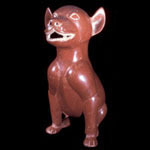 Colima is known for its ancient perros cebados (round dogs) ceramic sculptures. These objects are found in abundance here. Many have been found inside unique burial tombs that had been constructed as shafts (tiros). These delightful figurines are plump in appearance and appear to be dancing. It is believed their creation and placement had a divine purpose, to help guide the departed soul safely to heaven's door. While still in town, be sure to visit the city's museums: the Colima Regional History Museum and the Museum of the Western Culture. Pre-Columbian artifacts and pottery are on display, including the famous perros cebados. Just outside the city one can visit an archaeological site, La Compana Ruins (dating to 1500 B.C. ), where pyramids and a tomb have been excavated. Each year from late October through early November the town of Colima hosts their annual fair, Feria de Todos Santos (All Saints Fair). The largest fair in the state and dating back to 1826, this fair has carnival rides, parades, arts and crafts and all manners of expositions. 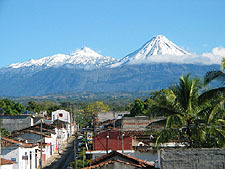 The twin volcanoes of Nevado de Colima (extinct) and Volcan de Fuego are located 25 miles north of the city. Volcan de Fuego is an active volcano that is considered the most volatile and dangerous in all of Mexico. Located within a national park, tours are available that take the visitor through a rich landscape of palm forests that is filled with exotic birds and lush vegetation. The fabulous Pacific coast of Colima attracts many visitors that are drawn to the state's incredibly gorgeous beaches and wide choice of water activities. Manzanillo is a major resort area located 160 miles south of Puerto Vallarta. 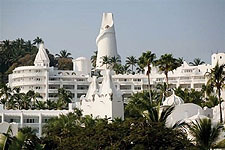 The famous Las Hadas resort where the popular film "10" was filmed is located in Manzanillo. Originally a port since the 16th century, the city today attracts many sports-fisherman. Manzanillo is oftentimes referred to as the sports-fishing capital of the world, sailfish, marlin, dorado and tuna all frequent these waters. The coastline of Colima, nearly 100 miles in length, has many beaches to choose from. Swimming and sunbathing are popular as is surfing. Some of the best waves on the Pacific Coast can be found here, huge swells that are recommended for only the most experienced. The water is clean, the beaches uncrowded and the environment lush, green and tropical. The water, a bright turquoise blue, calms the mind and delights the senses. Colima is truly a gorgeous state with so much to offer.